A spectacular light show is the setting for Dancing Dragon Spring Festival, a simple Chinese-themed video slot created by Playson. Beautifully designed, this 5 reel, 30 payline game doesn’t offer much in the way of bonus features but does provide a chance to win a jackpot prize equal to 5,000 times your total stake. Play on all devices from between 30p and £90 per spin. Playson games are usually very easy on the senses and Dancing Dragon Spring Festival is up to the developer’s usual high standards. A traditional garden filled with lanterns and blossoms forms the backdrop to the reels. Those reels take the form of a scroll. There you’ll find an assortment of traditional Chinese objects. You’ll see money wallets and kites which award up to 100 coins per payline followed by cymbals and drums and which award 200 coins. More rewarding still are the fire crackers and lanterns which pay 500 coins if you land 5 on a payline. The best paying symbol is the red dragon which offers awards of 50, 500 or 5,000 coins if you land 3, 4 or 5 on a payline. The golden coin is the wild – it doesn’t offer any payouts in its own right but does substitute for all other symbols apart from the dancing lion when it lands on the middle reel. Land 2, 3, 4 or 5 of the dancing lion scatter on the same spin and you’ll pocket an award equal to 2, 5, 20 or 100 times your total stake. Sadly, it doesn’t trigger any extra features. In fact, there aren’t any extra features to speak of. No re-spins, free spins, pick ‘em rounds or cash trails. The only potential sweetener to the base game is a bumper jackpot prize. To trigger that, you’ll need to land stacked dragons on all 5 reels and fill the reels. Manage that and a bumper bonus prize of some 5,000 times your total stake will be heading to the cashier. 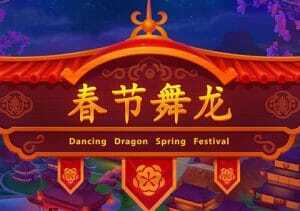 If you like plenty of bonuses and features from your video slots, then you may well find Dancing Dragon Spring Festival rather dull. There’s very little dazzle on the features front. It is a lovely looking and sounding game though and the stacked symbols can keep the base game ticking over. That wasn’t really enough to win us over though. This is one for fans of the Chinese theme only. I would rather play other Playson offerings with the superb Dracula’s Family highly recommended.